Please measure your child's neck using a piece of string, leaving room for at least two fingers to easily fit between the string and your child's neck. You should choose a length you feel comfortable with. Amber has strong connections with the earth and is a grounding stone for higher energies. It actually is not a stone at all, but rather an organic material made up of fossilized natural botanic resins. Tree resin is sometimes confused with sap and the two are actually quite different. Sap contains sugars from the tree while resin is actually formed as the result of the oxidation process of the tree’s essential oils. The resin acts as the tree’s healing mechanism by filling in wounds and actually healing infection that may result. Baltic Amber is special because of the conifer family that the resin comes from and the higher concentrations of succinic acid that it contains. Amber’s energy is considered solar and is thought to be helpful to those who can become depressed, especially those who tend to become depressed in winter. It is thought to absorb pain and negative energy and turn them into clear, usable frequencies. 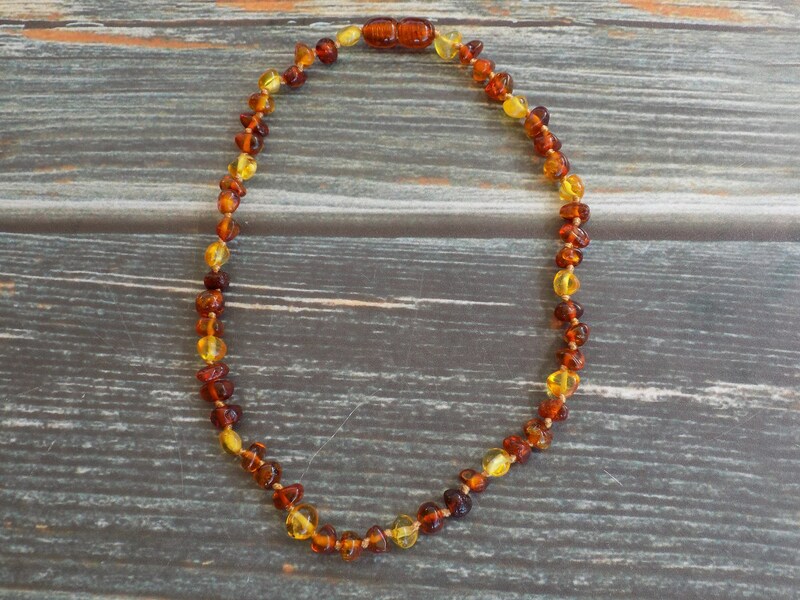 Amber carries the vibration of life force and fires the capacity to manifest prosperity. It is a powerful cleanser and supports the body in balancing and healing itself. Amber supports problems with the throat, stomach kidneys, bladder, and gallbladder. Amber also alleviates joint problems and strengthens mucous membranes. It is thought it can be helpful for mothers to wear amber before offering it to their children.